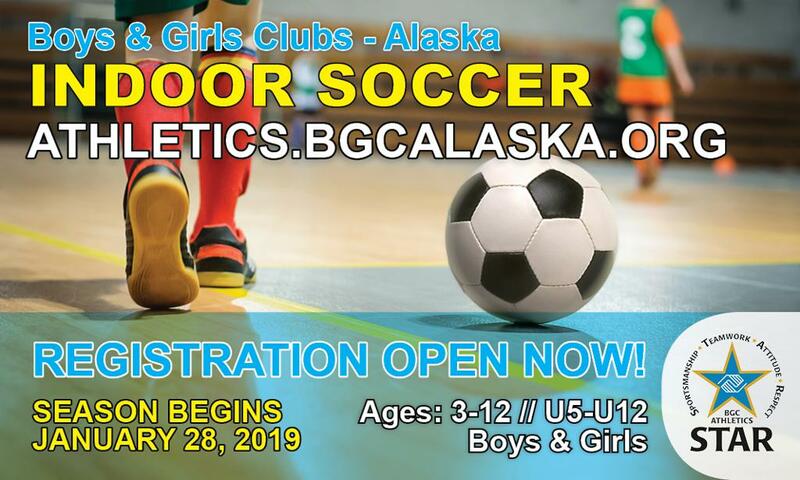 The Goal with the Boys & Girls Clubs - Alaska Indoor Soccer program is to provide its Members a safe, healthy, fun, and meaningful experience via regularly scheduled practices and games. The eight-week season will commence on January 28 and conclude March 29, 2019. U5-U8 practices will be held Tuesday evenings with games being held on Thursday evenings. U10-U12 practices will be held on Monday and Wednesday evenings with games being held on Friday evenings for the Spring 2019 season. Games will commence the third week of the season. For more information on Indoor Soccer, or Futsal as it is more commonly known, a variant of soccer that is played on a smaller field and mainly played indoors, please visit HERE. The Registration "INDOOR SOCCER" is not currently available.